Corn tortillas, cut into 6-inch squares --- 16 ea. Spanish onion, thinly sliced --- 1 ea. Garlic cloves, minced --- 2 ea. Basil leaves, minced --- 8 ea. Tomato sauce --- 16 oz. Zucchini, thinly sliced on a bias --- 2 ea. Mexican oregano --- 2 Tbsp. In a large pan with sides, heat vegetable oil over medium heat. When oil is hot, add 2 tortillas at a time until soft; remove and place on paper towels to dry. In a separate pan over medium heat, add 1/4 cup olive oil and onions; cook until golden brown. Add garlic and basil, cook 1 minute, and add TABASCO® Chipotle Sauce and tomato sauce. Let simmer 15 minutes, stirring occasionally. In another pan over medium-high heat, add remaining 1/4 cup olive oil and zucchini; cook until light brown. Add corn and poblano peppers; cook 2 more minutes. Add tomato sauce mixture and poached chicken; stir and turn off heat. In a 9" x 9" baking pan, place 4 tortillas on the bottom, layer 1/3 of the tomato-zucchini mixture on top, and sprinkle with 1 cup cheese. 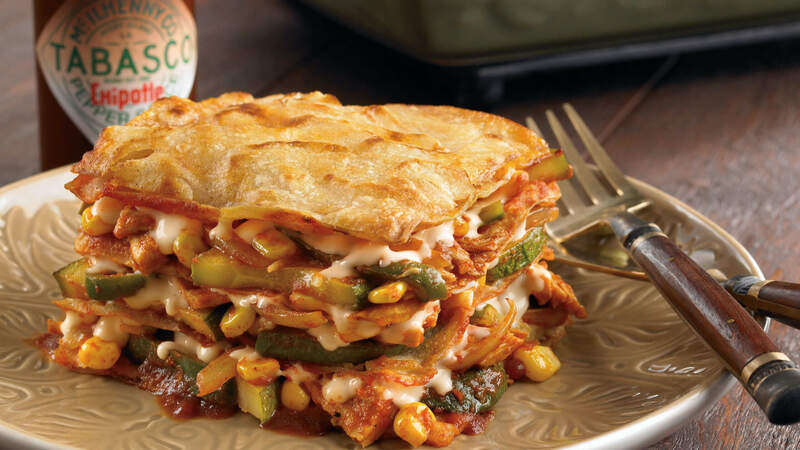 Layer tortillas, tomato-zucchini mixture and cheese twice more, then cover the top with 4 more tortilla squares. Bake in the preheated oven uncovered for 15 minutes. Allow to cool for 20 minutes, cut and serve.